April 1 marked the start of the Dorset and Wiltshire Fire and Rescue Service for residents of Bournemouth, Dorset Poole, Swindon and Wiltshire. The two neighboring Fire and Rescue Services announced support for the combination in April 2015 in order to save money, while continuing to provide the public with an efficient service. The merger required a new identity and public-facing platform to communicate the new united jurisdictions with authority and integrity. 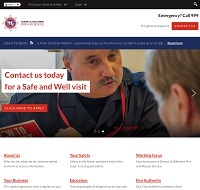 Having employed the help of creative agency Thinking Juice, the Fire and Rescue Service has launched a new, distinctive digital platform that gives the public reassurance around the merger and the ease to access useful information quickly. Investment for the site new came from a Government grant received to help the two services combine. Their goal to promote the health, well-being and home safety of its community remains their priority. The new site will allow the authorities to maintain communication with their surrounding communities at this crucial time. “Education around fire prevention and supporting the wider health agenda is of the upmost importance to the new Service. Thinking Juice have delivered an easily manageable platform that’s accessible for all the community and will stand the test of time. We’re excited about the benefits this will give us.” Vikki Shearing, Head of Information & Communication at Dorset and Wiltshire Fires and Rescue Service.